The 2012-2013 DMA Teen Docents. If you have spent any time at the DMA this summer, you may have noticed teenagers in gray DMA T-shirts leading groups through the galleries. 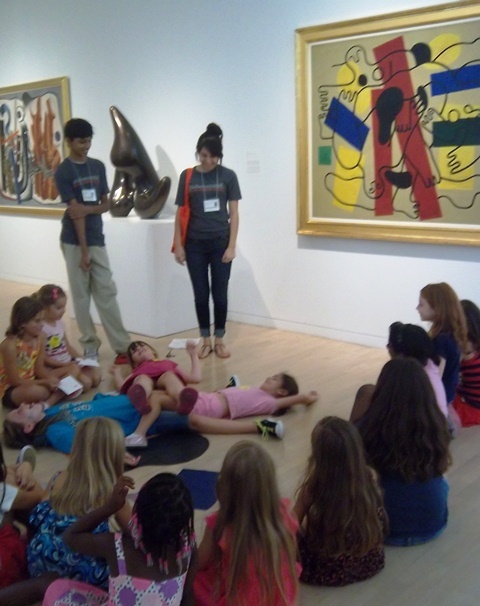 These aren’t just any teenagers, though—they are our dedicated DMA Teen Docents. 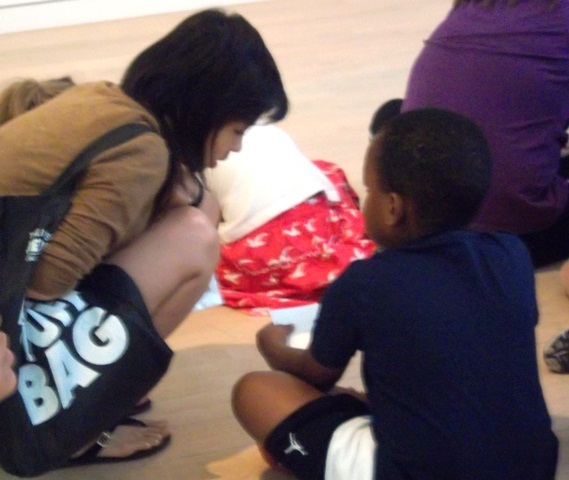 The Teen Docent program has been going strong since 2001, and this summer we have our largest group ever. Thirty-one high school students are spending their summer vacation at the Museum, and we are thrilled to have them with us. Our Teen Docents come from across the Metroplex, attending school at TAG Townview Magnet, Episcopal School of Dallas, Ursuline Academy, Greenhill School, Fulton School, Plano West, Plano Senior High, Cedar Hill Collegiate High, Jasper High, Vines High, Lovejoy High, Mesquite High, and Lake Highlands High. We even have one volunteer who lives in Bryant, Texas, but is spending the summer in Dallas so she can be a Teen Docent. Talk about dedication! Not only are the Teen Docents passionate, but they’re also really creative. Just look at what they made during a Creativity Challenge in June. Teen Docent Jasmine helps a visitor write a postcard. As the summer comes to a close, I want to publicly thank our Teen Docents for their hours of service to the DMA this year. Between leading tours, volunteering at Late Nights, and assisting in a myriad of roles on First Tuesdays, these teenagers go above and beyond when it comes to volunteering at the DMA. Shannon Karol is Manager of Docent Programs and Gallery Teaching.